Hotel Transylvania 2 is a 3D computer animated fantasy-comedy family movie that is scheduled to hit theaters on September 25, 2015. The movie has several A-list actors and actresses that lend their voice to various parts of the movie. The movie is produced by Sony Pictures Animation, directed by Genndy Tartakovsky and will be released by Columbia Pictures. Hotel Transylvania 2 is the sequel to the 2012 movie Hotel Transylvania. 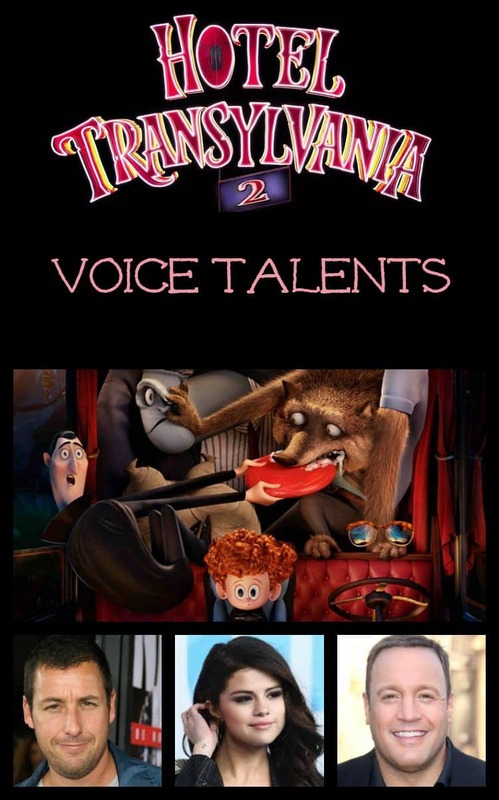 Here is the voice cast of Hotel Transylvania 2. Related: Is Hotel Transylvania 2 a Good Family Movie for Kids? Adam Sandler provides the voice for Count Dracula. He is the father of Mavis and the owner and manager of Hotel Transylvania. Adam is an actor, comedian, producer, musician, entrepreneur and screenwriter. Andy provides the voice of Jonathan, AKA Johnnystein. Jonathan is a human who becomes friends with the monsters at the hotel. He is also the husband of Mavis and the father of Dennis. Andy is an actor, producer, comedian, writer and singer. She provides the voice of Mavis, the vampire daughter of Count Dracula. She is also the wife of Jonathan and the mother of Dennis. Her dream is to go out and see the world. Selena is an actress, fashion designer and singer. The comedian provides the voice of Frankenstein, one of the best friends of Count Dracula. Kevin is an actor, producer, comedian and screenwriter. The incredibly funny Steve provides the voice of Wayne, a werewolf, one of the best friends of Count Dracula. Wayne is married to Wanda and is the father to the Werewolf Kids. Steve is an actor, director and writer. Another comedic legend, he gives voice to Griffin, the Invisible Man, one of the best friends of Count Dracula. David is an actor, comedian, television personality, writer, dancer and musician. Provides the voice of Murray, a mummy who is short and stout and one of the best friends of Count Dracula. Keegan-Michael is an actor, comedian and writer. Perhaps the greatest comic of all time, he provides the voice of Vlad, the vampire father of Count Dracula and the grandfather of Mavis. Mel is an actor, director, composer, producer, songwriter, comedian and screenwriter. One of the most unique voices ever lends her voice to Eunice, Frankenstein’s wife. Fran is an actress, comedian, activist, producer, model and ordained minister. Gives voice to Wanda, a werewolf who is married to Wayne. She is also the mother to the Werewolf Kids. Molly is an actress. Provides the voice of Mike, the father of Jonathan. Nick is an actor, humorist, writer, carpenter and Freemason. Provides the voice of Linda, the mother of Jonathan. Megan is an actress and singer. I often forget when watching movies like this that it’s usually famous people providing the “voices.” Unless the voice is simply unmistakable. Sounds like a fun show. Oh wow! What a great cast! I can’t wait to see this movie! Although I have to admit I haven’t seen the first one yet. Looks like an amazing movie filled with full of comedy that any family could enjoy during a movie night. It is absolutely great that many big stars are doing the voices, which will make it more interesting. This sounds like a cute movie. I’ll have to add it to our must see list. Oh wow, there are a lot of recognizable actors. I still need to see the first one. I must have missed out big time! This sounds like a great movie. I’ve seen the first one and enjoyed it. I can’t wait to see this movie. I would recognize Adam Sandler’s voice by that’s probably all though. Now I’m going to have to pay closer attention and try to pair who is playing which character! Wow. Big name stars doing the voices. Must be a good movie! I need to see this. I am just a little kid at heart! I love this movie! I love the cast too. They are really all good. I am so behind. I need to see the first one. Great talent. I had no idea there were so many celeb voices in this movie. Sounds like an awesome lineup.